I saw the B-52s in concert in 1991 or 1992 and the first thing I thought when I watched their most recent DVD, With The Wild Crowd! Live In Athens, GA, was that this was exactly like seeing them in concert, amazingly enough, twenty years later. 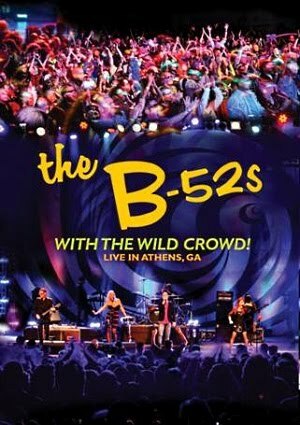 The concert, which celebrated the 34th anniversary of the B-52s' first gig and saw them return to Athens, GA for a 2011 Valentine's Day show was released on DVD this March. The concert was a good, strong performance of exactly what has kept them popular throughout their career: quirky, infectious songs that celebrate the party in all of us. But I must admit, when I first started watching the DVD, I didn't think it was great; the missing element was the crowd. There is just nothing like being part of the crowd at a B-52s concert, and you can see them in the video, with crazy hair and ecstatic grins and the wild costumes that are part of the B-52s experience. I watched this show and wished I had been there because then it would have been fantastic! But my initial assessment was that With The Wild Crowd! Live In Athens, GA was solid. However I made that judgement prematurely. I had faith enough in their fans' energy that I wished I had attended that particular concert, but I didn't have enough faith in the B-52s. (Forgive me!) Unlike so many others, the longer this band performed, the higher their energy rose until it was veritably leaking out of the screen. While there was very little back and forth interaction between the crowd and front people, Fred Schneider, Cindy Wilson, and Kate Pierson, they clearly didn't need extra chitchat to help communicate with the crowd, or with the at-home viewer for that matter. By the end of the concert, ending spectacularly with "Strobe Light," "Planet Claire," and the famous "Rock Lobster," I was bopping around the room, singing along, and fighting the impulse to put on my go-go boots. The DVD also includes a nice lengthy interview of Schneider, Wilson, Pierson, and Keith Strickland discussing how they all met and how beginning was almost more of an art piece than any intention to start a band. With some really fun stories and a look into their personalities, it was nice to reminisce along with the band. Featuring 20 of some of their most popular songs, overall, I would say this concert DVD is a very nice must-have for the B-52s fan, or for anyone who wants to put on something fun for a party.